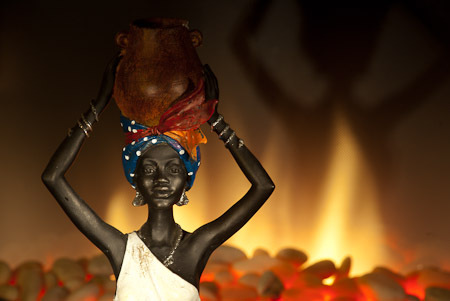 This is a figurine placed in front of an electric fire and then the metering exposed for the fire. The result was a silhouette of the figurine, so I used a torch to illuminate that. The first few attempts were either too bright or had reflections on the background. This one was done with the torch firstly positioned on the left so the shadow projected on the back and then a small amount to the right to evenly balance the exposure on the face. A slow shutter speed gave me time to move the torch around during the exposure and has created the blurry flames.